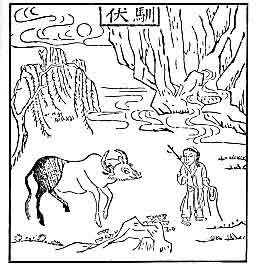 The Ten Oxherding Pictures, I.
Searching for the Ox. The beast has never gone astray, and what is the use of searching for him? The reason why the oxherd is not on intimate terms with him is because the oxherd himself has violated his own inmost nature. The beast is lost, for the oxherd has himself been led out of the way through his deluding senses. His home is receding farther away from him, and byways and crossways are ever confused. Desire for gain and fear of loss burn like fire; ideas of right and wrong shoot up like a phalanx. Seeing the Traces. 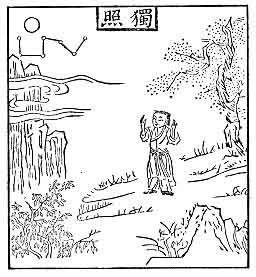 By the aid of the sutras and by inquiring into the doctrines, he has come to understand something, he has found the traces. He now knows that vessels, however varied, are all of gold, and that the objective world is a reflection of the Self. Yet, he is unable to distinguish what is good from what is not, his mind is still confused as to truth and falsehood. As he has not yet entered the gate, he is provisionally said to have noticed the traces. The sweet-scented grasses are growing thick--did he find the way? His nose reaches the heavens and none can conceal it. The splendid head decorated with stately horns what painter can reproduce him? 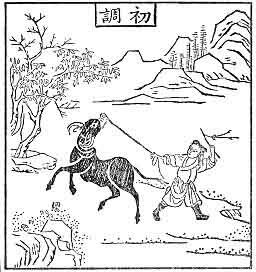 Catching the Ox. Long lost in the wilderness, the boy has at last found the ox and his hands are on him. 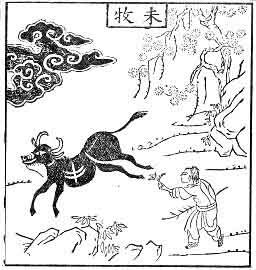 But, owing to the overwhelming pressure of the outside world, the ox is hard to keep under control. He constantly longs for the old sweet-scented field. The wild nature is still unruly, and altogether refuses to be broken. 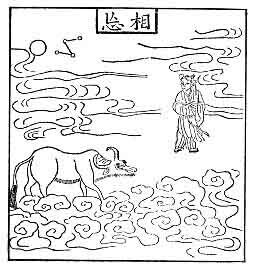 If the oxherd wishes to see the ox completely in harmony with himself, he has surely to use the whip freely. When lo! he is lost again in a misty unpenetrable mountain-pass. Herding the Ox. When a thought moves, another follows, and then another-an endless train of thoughts is thus awakened. Through enlightenment all this turns into truth; but falsehood asserts itself when confusion prevails. Things oppress us not because of an objective world, but because of a self-deceiving mind. Do not let the nose-string loose, hold it tight, and allow no vacillation. 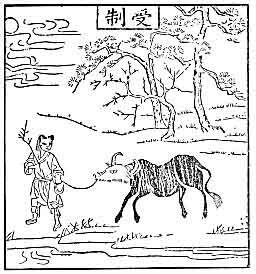 Without a chain, nothing binding, he will by himself follow the oxherd. Coming Home on the Ox's Back. The struggle is over; the man is no more concerned with gain and loss. He hums a rustic tune of the woodman, he sings simple songs of the village-boy. 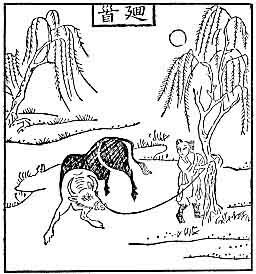 Saddling himself on the ox's back, his eyes are fixed on things not of the earth, earthy. Even if he is called, he will not turn his head; however enticed he will no more be kept back. The Ox Forgotten, Leaving the Man Alone. 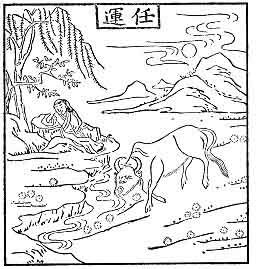 The dharmas are one and the ox is symbolic. When you know that what you need is not the snare or set-net but the hare or fish, it is like gold separated from the dross, it is like the moon rising out of the clouds. The one ray of light serene and penetrating shines even before days of creation. Where lo! the ox is no more; the man alone sits serenely. Under a straw-thatched roof are his whip and rope idly lying. The Ox and the Man Both Gone out of Sight. All confusion is set aside, and serenity alone prevails; even the idea of holiness does not obtain. 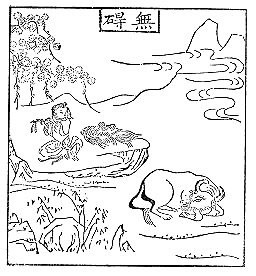 He does not linger about where the Buddha is, and as to where there is no Buddha he speedily passes by. When there exists no form of dualism, even a thousand-eyed one fails to detect a loop-hole. A holiness before which birds offer flowers is but a farce. Who can ever survey the vastness of heaven? 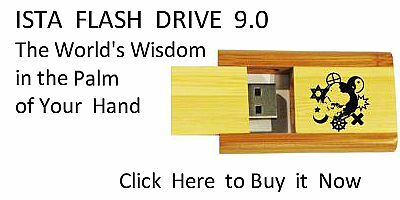 When this state of things obtains, manifest is the spirit of the ancient master. Returning to the Origin, Back to the Source. From the very beginning, pure and immaculate, the man has never been affected by defilement. He watches the growth of things, while himself abiding in the immovable serenity of nonassertion. He does not identify himself with the maya-like transformations [that are going on about him], nor has he any use of himself [which is artificiality]. The waters are blue, the mountains are green; sitting alone, he observes things undergoing changes. To return to the Origin, to be back at the Source--already a false step this! Behold the streams flowing-whither nobody knows; and the flowers vividly red-for whom are they? Entering the City with Bliss-bestowing Hands. His thatched cottage gate is closed, and even the wisest know him not. No glimpses of his inner life are to be caught; for he goes on his own way without following the steps of the ancient sages. Carrying a gourd he goes out into the market, leaning against a staff he comes home. He is found in company with wine-bibbers and butchers, he and they are all converted into Buddhas. Daubed with mud and ashes, how broadly he smiles! For he touches, and lo! the dead trees are in full bloom. [1. 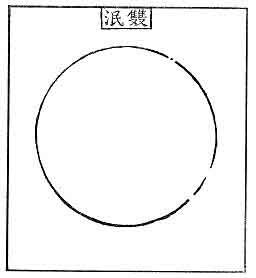 Symbol of emptiness (sunyata).